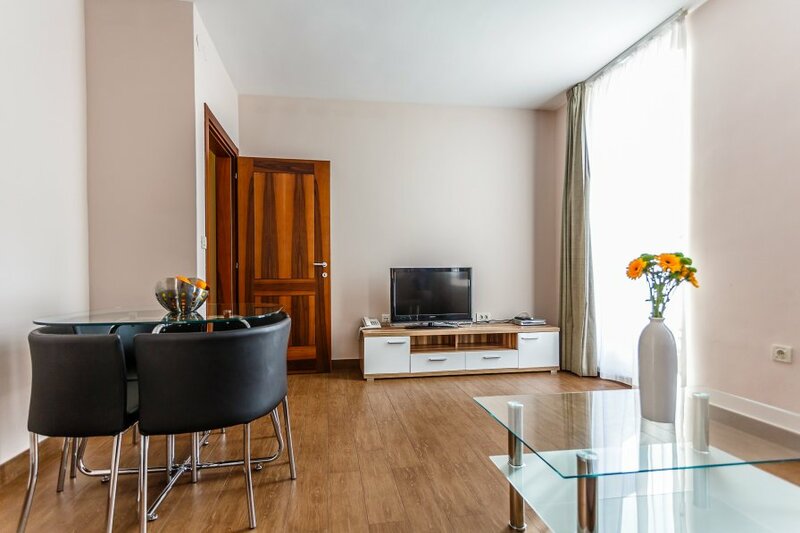 This unit has two rooms: sitting room with access to the balcony and one bedroom, bathroom and a small kitchen. Situated on the first floor invites guests to enjoy beautiful sea view. Malinska is situated in a wooded bay on the western side of the island of Krk with another twenty surrounding villages belongs to a territory known as Dubašnica. The Dubašnica bay has a wealth of both large and small coves and thanks to its geographical position the area is protected against cold winds, with little rain and about 260 days per year. The climate is mild. Mediterranean. There are more than 50 km of footpaths in the Malinska area. Most of these pathways are suitable for cycling so a number of cycling races take place throughout the year. Walking along the sea front you can reach the village of Njivice 5 km away or along the footpaths you might like to take in the interesting local places such as the old cemetery, the monastery in Porat and the archaeological site in Cickino. The island of Krk's wealth of culture, historic and customary inheritance will be of interest to all those wanting to explore its centuries and past. Two most important finds are the Roman municipium Curicta (Krk) were Krk Cathedral is of particular importance, as it was the mail church of the 1500 year old Krk Bishopy, as well as the long abandoned ancient town of Fulfinum near Omišalj, which was built in 1st century AD. You can take part in numerous activities in Malinska such as parachuting, jet-skiing, pedal boats, rent-a-boat or kayak or why not a spot of sightseeing of the adjacent beaches and inlets. Summer events and festivals, concerts of classical music take place within the atrium of the Franciscan monastery, with traditional klapas and folkloristic group performances, art exhibitions, numerous sporting events such as cycling races and cruiser reagattas which also offer the possibility of entertainment. Recommended for families with max two children which sleep on sofa in living room.